Whenever we feel that we need to run our too-relaxed Tuscan adrenalin, we end up in the hectic Rome, on the flourishing veranda of MariaPina and Massimiliano. They never understand our urge for traffic and crowded streets, but always pleased from our enthusiasm to sample their Lazio’s local cuisine. Mariapina indeed lives fast, but cooks slow. 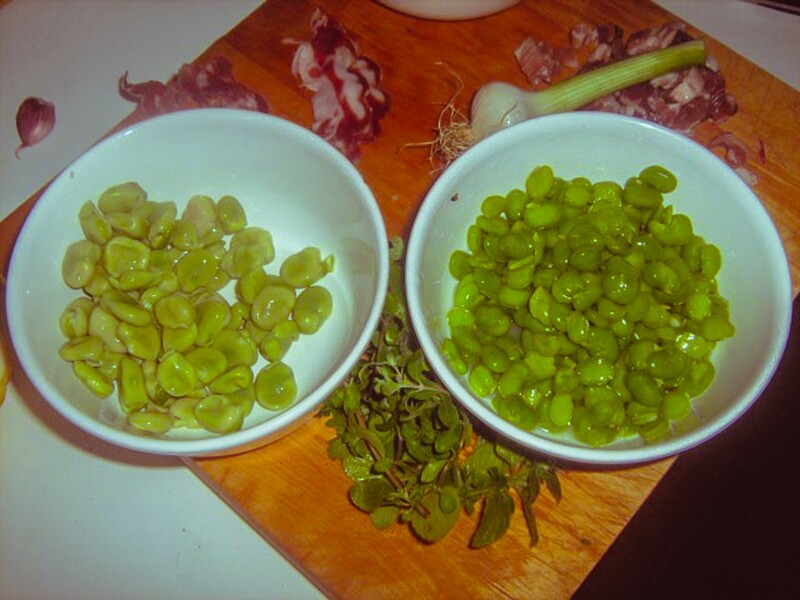 At the beginning of spring time she ask Massimiliano to search the markets for fresh peas and green beans for the Vignarola, a seasonal traditional dish that is excellent either warm or tepid (as a veggies accompany). In a pot, fry on a low flame the onions in the olive oil until transparent. Add the artichokes, stir well and add salt and pepper. Cover and cook on a low flame for 10 minutes, adding some spoons of water if necessary. Add the green beans and the peas. Eventually add the lettuce. Cooking time varied according to the freshness of the veggies. If, like Mariapina, you use very fresh ingredients, the Vignarola should be ready after half an hour.